Mark & model : Features of XDA-120 toilet soap stamping machine: It can stamp various kinds of end soaps with different sizes, shapes and weights; it would make elegant logo printing, smooth appearance and beautiful shapes. 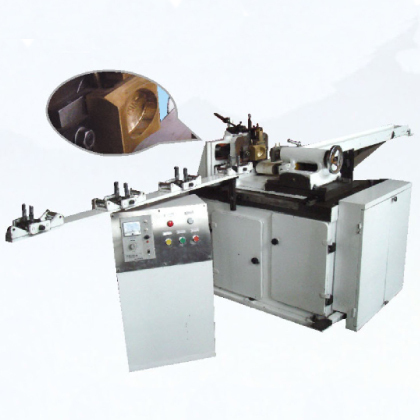 The toilet soap stamping machine is used to cut, shape and print the soap bar extruding from the former machine vacuum plodder. It uses crank-link mechanism instead of worm-wheel, which eliminates vibration and improves productivity, increases the productive capacity and prolongs the life-span. The stamping machine can produce round, oval, and quadrate soaps. Connecting with a refrigerator to the stamping machine’s mould, the soap is easily to demould. The surface of soap is smooth, the logo is neat and good-looking.